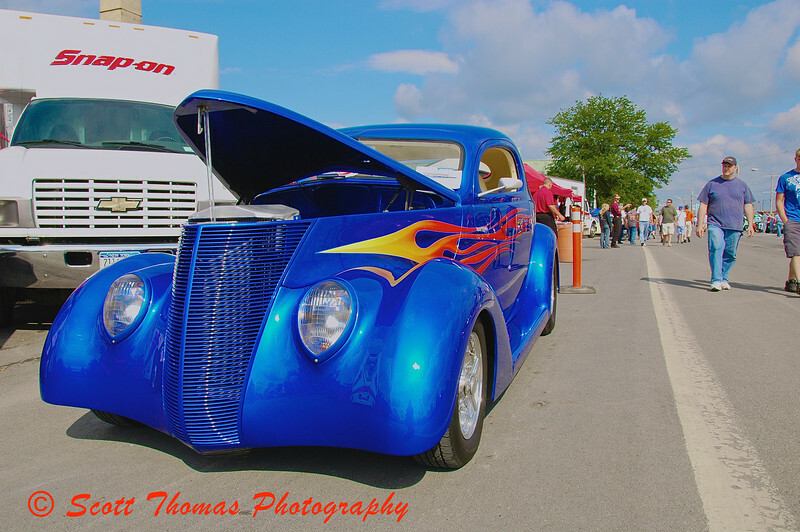 Some of the nearly 7,000 hot rods, muscle cars and classics at the Syracuse Nationals last weekend at the New York State Fairgrounds. The rainy day forecasted turned into a dry, warm and perfect day to for me to spend at the 10th annual Syracuse Nationals Hod Rod Show. 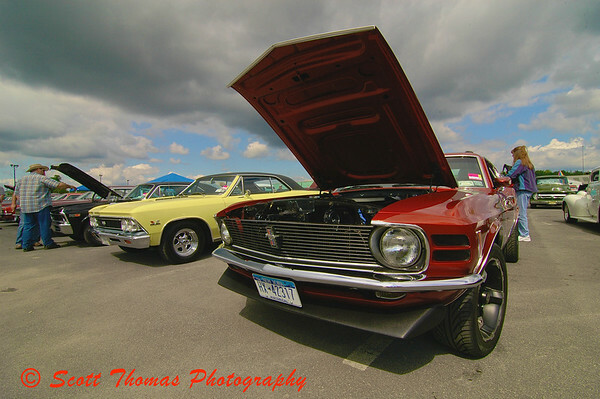 Nearly 7,000 hot rods, muscle cars and classics filled the New York State Fairgrounds last weekend. The passion the owners of these vehicles is apparent with meticulously polished and maintained surfaces shining for my camera to capture. 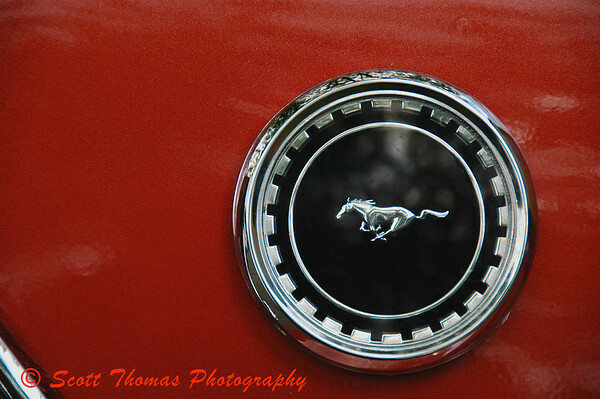 The famous running Mustang logo from a classic 1969 Ford Mustang muscle car at the Syracuse Nationals Hot Rod Show. Winning at a car show as large as the Syracuse Nationals means you have to get every detail of your car cleaned, polished and presented for the judges. I can not imagine the task that must have been as I was overwhelmed in the sea of beautiful cars. 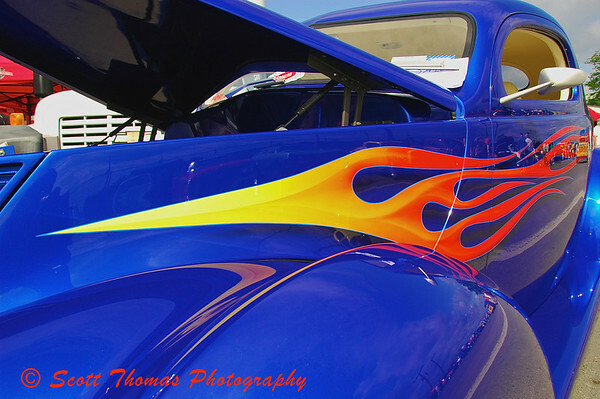 Flames and bright colors are what draw me to a hot rod. Click on photo to see the entire car. 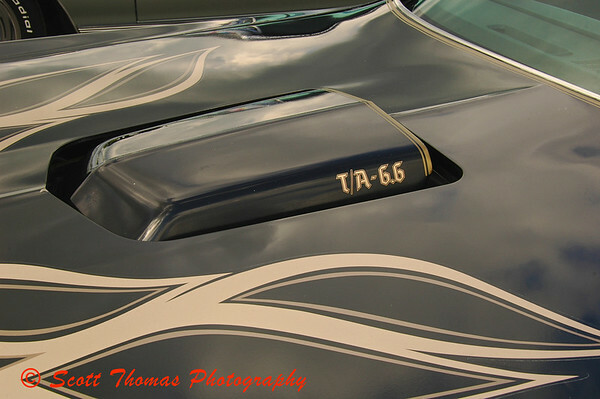 Muscle cars from the 1970's are a favorite of mine like this shaker hood from a 1977 Pontiac Trans Am Black Bird. Click photo to see the entire car. Of all the styles of hot rods, I like the coupes the best. Add flames and bright colors and I can’t resist photographing them. Chromed grills and engine bays cause havac with my camera's meter but I still can't resist them. Click on photo to see entire hot rod. 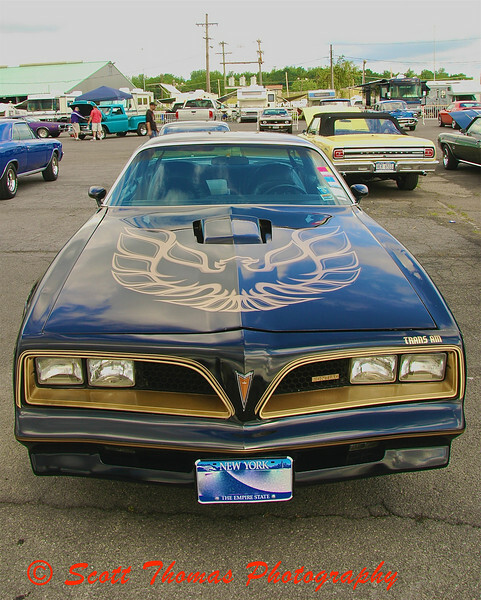 This entry was posted in Event and tagged auto, automobile, cars, classic, coupe, ford, hot rods, muscle cars, mustang, new york, Photography, pontiac, syracuse, syracuse nationals, trans am. Bookmark the permalink. Great shots Scott, the colors, lines and curves are amazing, well done !! Holy Wah! 7000 cars! There probably aren’t 7000 cars in all of Antrim County. (Not counting trucks of course. Probably more than 7000 of those, many of them quietly subsiding into the soil in the back forty.) And they are gorgeous cars . . .
And astonishment! You have figured out how to display one photo in a post and attach it to a different one, and I want to know how to do that! It is an intriguing technique. I can think of all sorts of uses. It was an amazing sight, Gerry. I’ve emailed you how I did the image links. 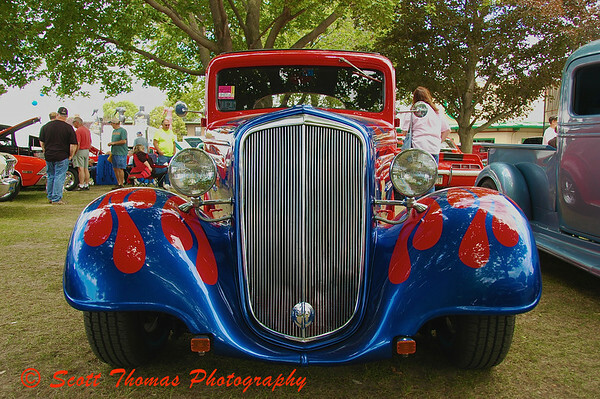 All of last week, there where hot rods everywhere around Syracuse. Planned and unplanned cruising down popular boulevards. At ths show, they had burnout and flame-thrower contests. Scott, Nice photos indeed! I like the perspective – going for the lines and details. One of my biggest challenges is NOT getting people in the shot when I’m at a cruise-in or show. It’s harder to get them out in the post process. Great work! Hard to avoid people at this show. They probably had close to 50,000 people there that day. Getting in close is something many people don’t do and miss all the neat details these people do with their cars. What I sometimes forget to do is then take a photo of the entire car so I can remember where the closeups came from. 🙂 Did pretty good this time. Only a couple out this time. 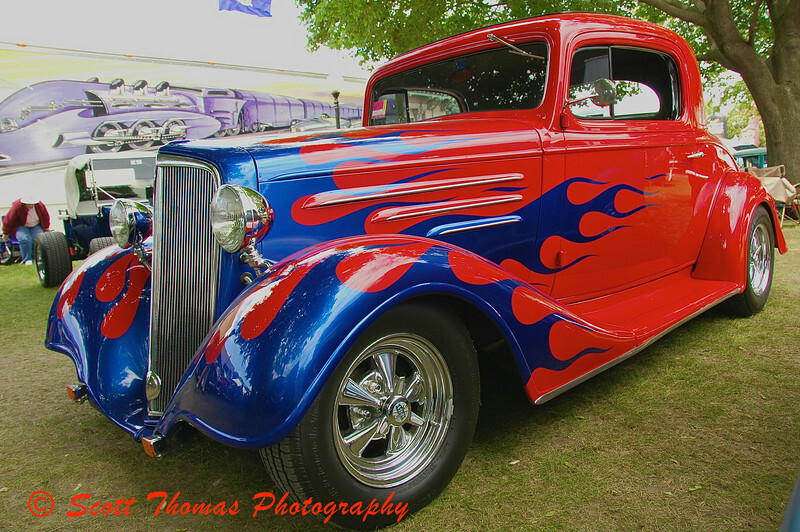 Hi Scott, nice shots of hot rods! Not really into cars myself but I do love the angles and curves! Those are some wonderful car images. Very cool! When posting a photo using WordPress.com, look for the “Link Image to” field, that field allows you to place any link you want people to go to when clicking on the image. The one thing I don’t like about it is people leave your blog when they click on it instead of opening a new tab or window. Scott, these are great! Thanks for letting me know you posted them. You’re welcome, Michaela! Enjoyed your car series, too. Great shots Scott I was at the show as I am every year and it was a blast. There were over 7100 cars this year and it grows every year. This is one of the best shows in the country I urge everyone to visit!! !